Dear Sansei, We miss you so much! Would you please consider opening a restaurant near us? 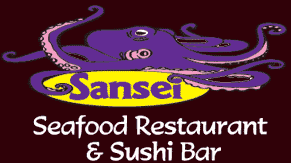 One of our favorite restaurants in Hawaii is Sansei Seafood Restaurant & Sushi Bar. We first fell in love with Sansei on the Big Island and since then we’ve looked for any opportunity to return. I must admit, I’m still working on being a bit more brave with trying sushi. Honestly, there’s nothing I’ve tried that I haven’t liked, so I have no reason to be so unadventurous. Andy, on the other hand, would likely try just about anything. I think he and Anthony Bourdain would become big pals if the ever had the opportunity to meet. Sansei’s Restaurants are the perfect place for Andy and I to go, because I can always fall back on tame sushi-ish dishes like the Mango Crab [cooked] Salad Handroll in a Thai vinaigrette or the melt in your mouth Matsuhisa Style Miso Butterfish (photo). Though Andy and I differ a tad on our spirits of culinary adventures, one appetizer that we both enjoy tremendously and never miss ordering is the Crispy Fried Calamari with spicy Japanese cocktail sauce. As a good ol’ Southern saying goes, it’s so good it would make your tongue slap your brains out. I’ve asked what’s in the spicy Japanese cocktail sauce and was told it’s a secret. The best way I can try to describe it is an Asian version of the best buffalo hot wing sauce. I bet a chef would cringe at my description, but it’s the best I can do. Some of the best and most creative sushi was at Sansei. I know locals don’t think of Sansei so much anymore because it’s in Waikiki, but if you get a chance, you should go. Their sushi rolls were very fresh and presented with artful flair. You’ll find a Sansei Seafood Restaurant and Sushi Bar on the islands of Maui (in Kihei and Kapalua), Oahu (in Waikiki), and the Big Island (in Waikoloa). Sansei Restaurants seem to have fair menu prices. Appetizers start at $3, but I’d say most are in the $9 range. Entrees start at $16. Most of the locations offer special deals if you’re seated at a certain time – either early or late. Call ahead and ask what their special discounts are. You can find the phone numbers from their Web site. Andy and I recommend the chef’s tasting menu, if it’s offered. Usually, they are good deals plus it’s a great introduction to Sansei’s menu. Sansei is popular with both locals (especially on the Big Island and Maui) and visitors, so it’s best if you make a reservation. If you happen to pop into a Sansei and there’s a long wait, check for seating at the bar where you can access the full menu. Have you been to a Sansei Restaurant and Sushi Bar in Hawaii? What was your favorite dish? Yay! Thanks for the shout out. Sansei IS that good! I’ll send your blog to one of the restaurant’s partners, Master Sommelier Chuck Furuya. Who knows, right? There are so many great places to eat in Hawaii. Sansei is among a very select group of restaurants I make a point of returning to whenever I can. I can understand you miss Sansei. Looks very appetizing. I’d go for vegetarian sushi though (if they have it). Fortunately, most sushi places always have veggie california rolls. I’ll never get tired of sushi! Reminds me of Nori, a Japanese restaurant in the Swedish city Linköping, where they served sushi with mango. Delicious! We will be back to Hawaii in a few days. We look very forward to visiting Sansei again. I totally disagree with you Daniel. Sansei is most definitely a sushi restaurant. It was listed in Conde Nast Travel Magazine as one of the top 10 sushi restaurants in the world. Excellent food & excellent atmosphere. I have been in the food & wine business for the past 25 years & can be quite a critic myself. Who cares if they would last in Japan? They are in Hawaii! Sansei is one of the must-go restaurants on Maui. We end up going two or three times week while on vacation there. They also have early-bird 40%-50%-off nights on Sunday and Monday if you get there within the first half hour of opening. They even get line-ups outside the door before the restaurant opens. I highly recommend the Mango-Crab Salad Handroll, Rainbow Roll and Teriyaki beef. we have never tried anything there that we didn’t like- it is all good. Shauna – my mouth watered as I read the words “mango-crab salad handroll” that is definitely one of my favorites! Where are the best Oahu restaurants?